Forest Garden tour this weekend! This Saturday, April 29 we will be hosting a forest garden walk and talk. We’ve been foraging in the forest garden just about every day this week! This is a great time of year for perennial vegetables because they start yielding so early. We’ll make a gluten free fritatta as a snack for the garden tour this Saturday with ingredients sourced from the garden. One of my favorite spring greens is stinging nettles. They’re a little challenging to harvest, but once you cook them up, they are positively gourmet! 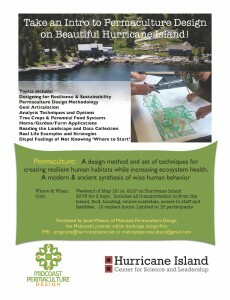 Spring Permaculture Garden tour – this Saturday April 29, 10-1. Free to all. You’re invited to a garden tour of our homestead where we’ll talk about the goals for our site, the design, some of the challenges and successes we’ve seen over the years. Feel free to bring a gluten free snack to share, but not required. Kids are welcome, dogs are not. We’ve been dividing and potting up some of our plants and we’ll have a selection of perennial vegetables and ecosystem plants for sale. It’s still on the early side for a garden tour, so we may repeat this event in a few weeks. Send us an email if you’d like to come so we know how many to expect. 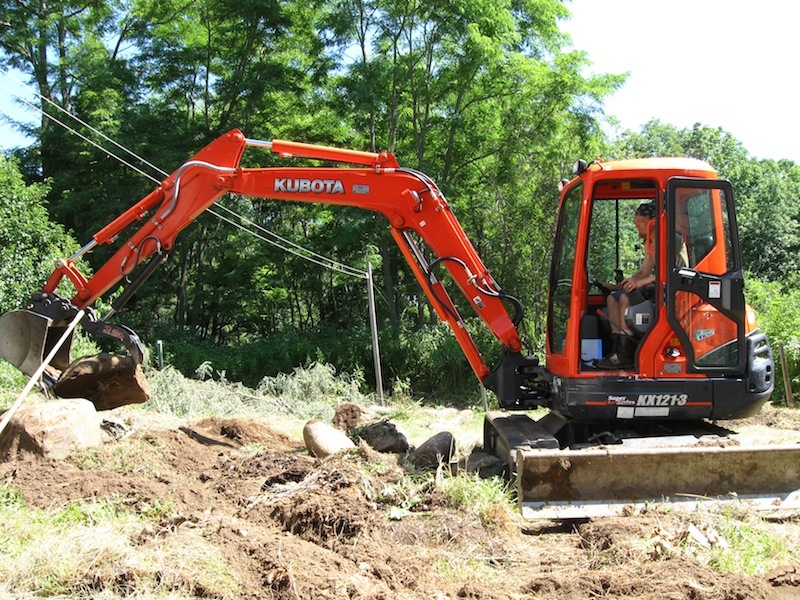 This was the first terrace construction project at my house where i felt compelled to use an excavator to move as much earth as i needed. 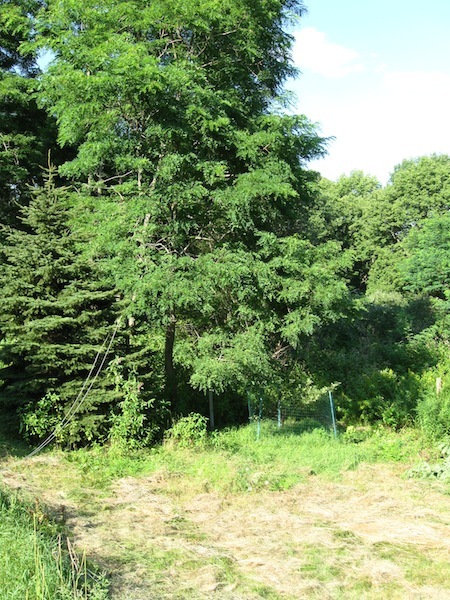 This is on a hillside site in Rockland, ME with southeast facing aspect and fine sandy loam soil that drains readily. 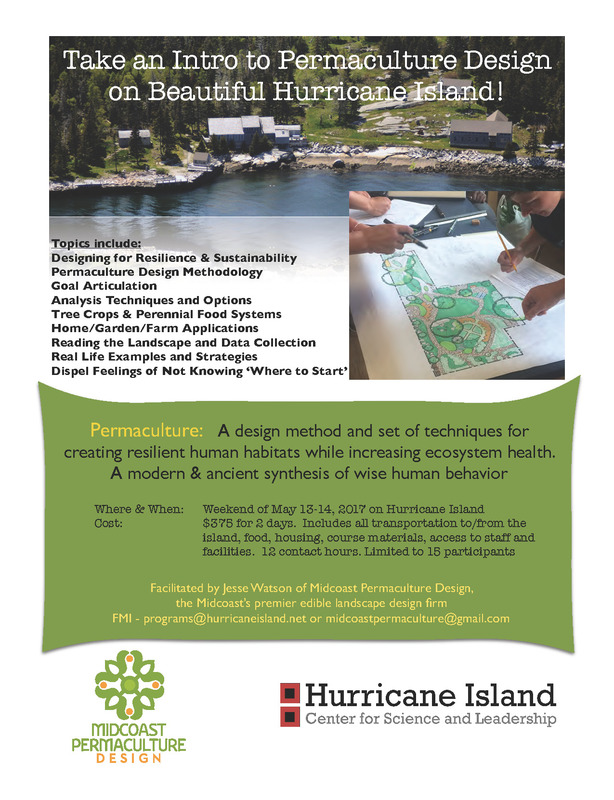 The goals for this project are to catch and store water and biomass, establish perennial polyculture gardens and integrate small livestock. 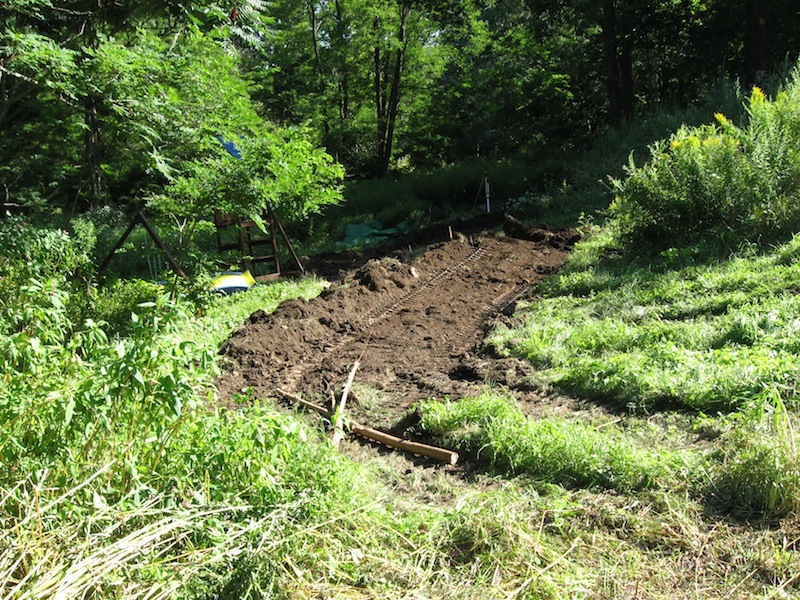 Austrian permaculture farmer Sepp Holzer was very inspirational to me with this construction project. At first the slope was the primary design challenge. 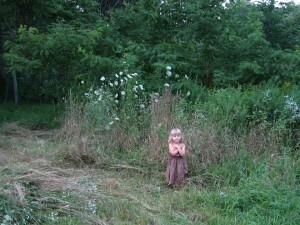 After watching Holzer’s video “Farming with Nature” it all clicked. By using the contour lines to my advantage, i could create a series of terraces and ponds. I had to adapt the patterns of path design to something that would work on a hillside. My wife wanted mandala gardens with concentric rings of paths and beds. At first I did too, and it would have been nice, but i learned that that sort of ornate path geometry works best on flat ground. Sure, you can draw the paths on paper, but when you go to marry the paper design to the real world, that’s when things get ‘ground-truthed’. So in this case where initially i wanted nested concentric rings as the garden path pattern, i had to adapt it instead to more of a branching pattern. Larger arterial paths for carts connected to smaller keyhole-style footpaths. We’ll show a detail of the path geometry in a future article. This was the height of the verge before i started. 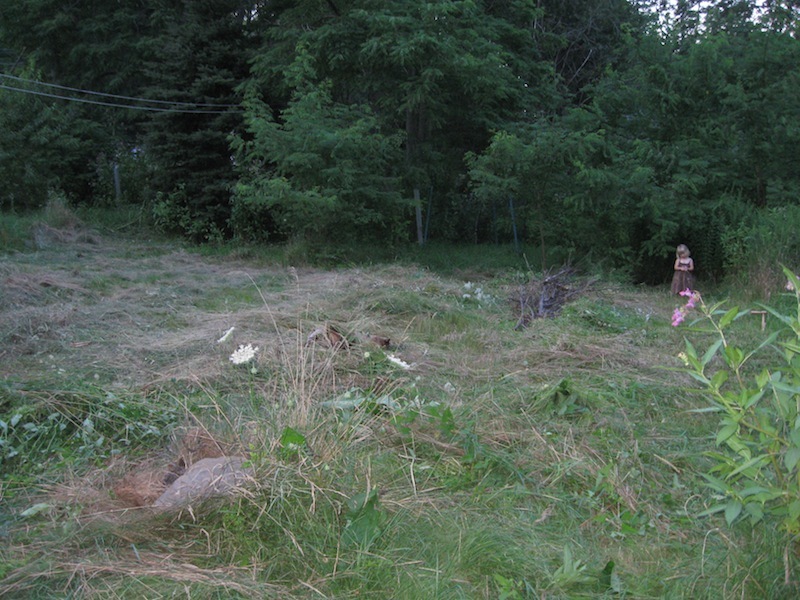 Former lawn that we let revert to meadow. My daughter is for scale. She’s 2’3″, exactly half my height…give or take… The first order of business was to cut the tall biomass and set it aside so that we could see the ground and mark out our contour lines. The verge was separated into herbaceous biomass to be used as mulch and woody biomass to be used as the base of the hugelkultur. The verge was cut into windrows with the scythe for ease of collection. I used a tarp to pile up herbaceous biomass and move the whole pile. I had to cut this black locust so i could get the machine down the northern property line. It yielded some nice logs to use as fence posts, some firewood, and lots of material to use as the hugelkulture base for a couple terraces. This gives a little better perspective on the slope we’re working with. This is the lowest-most terrace, the place i started so i could get used to working the controls. 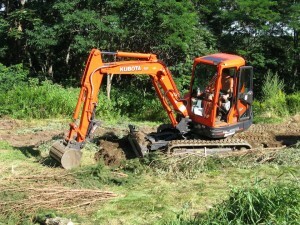 I used a Kubota KX121 rented from Union Farm. I rented it for 12 hours, clocked 14 and burned probably 100 energy slaves (that’s a guess!). The wonders of internal combustion engines and hydraulic pistons! 14 hours and a machine or 10-12 guys and a month of hard labor? 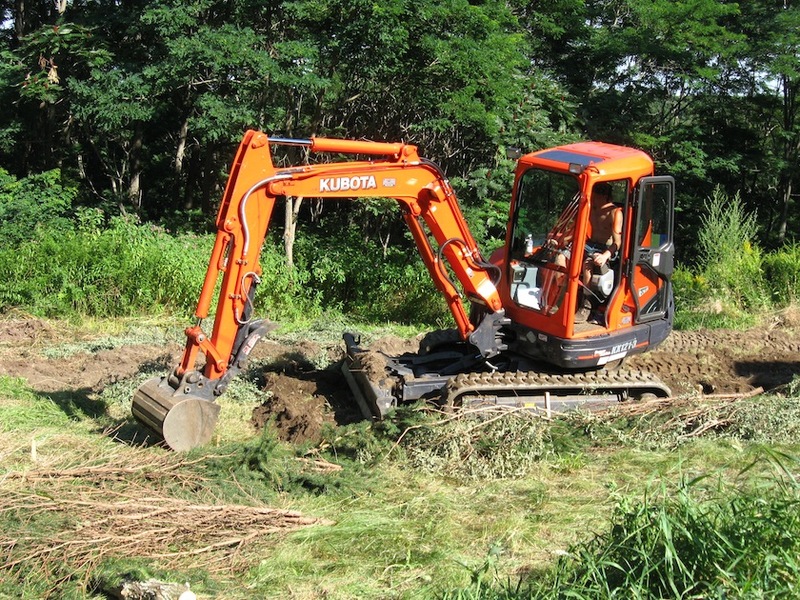 It had a 24″ bucket with 6′ wide blade that could lift, pivot and tilt. Talk about tractor envy! The thing was so new it still smelled like a new car. 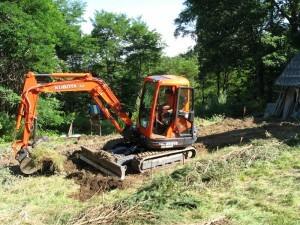 One thing i discovered while learning the controls on the machine was that sometimes there is plumbing below ground! Luckily it was just a perforated foundation drain pipe, and was easily repaired. 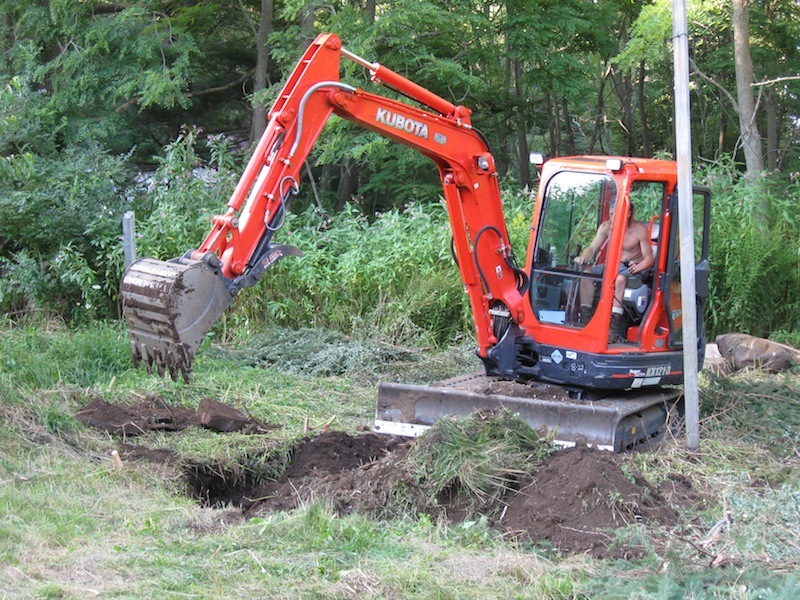 I’m just glad it wasn’t a piece of rigid PVC pipe headed to the septic tank! I only tore up two sections of foundation drain. The valuable lesson here was that there was subterranean infrastructure. 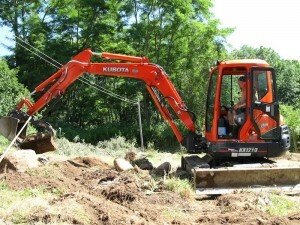 Here we’re placing large rocks in the retaining wall. The elevation drop between each terrace is only between 24-36″. 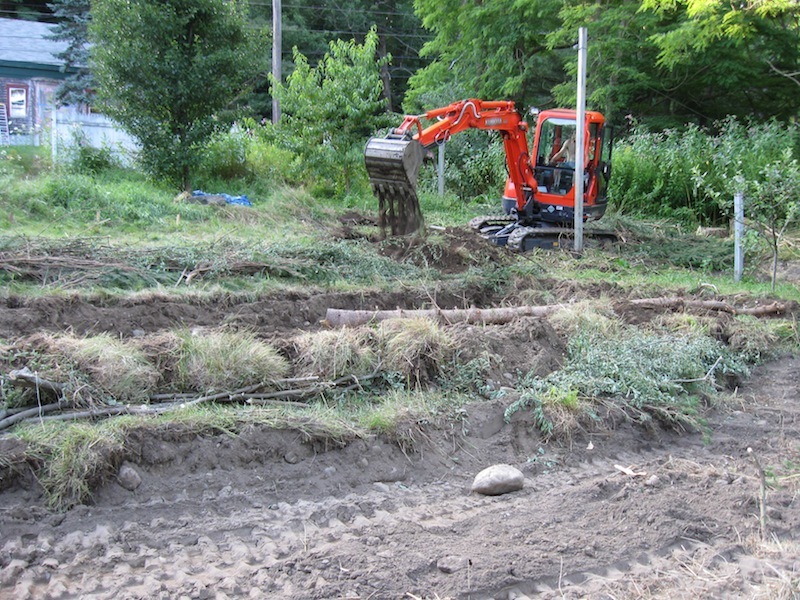 For the 36″ drop i decided to use the big rocks i found in the earth to use as a retaining wall. For the other terraces, the angle of repose is close to 1:1 which is self-stable and doesn’t need reinforcement. By now i was calibrated to the controls of the machine that i could scrape off only sod. Probably the top 2-3″ of earth and no deeper. 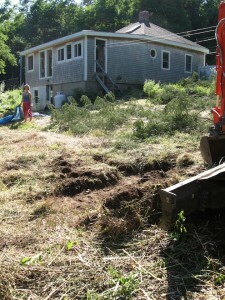 The septic tank was only about 8″ under the surface. 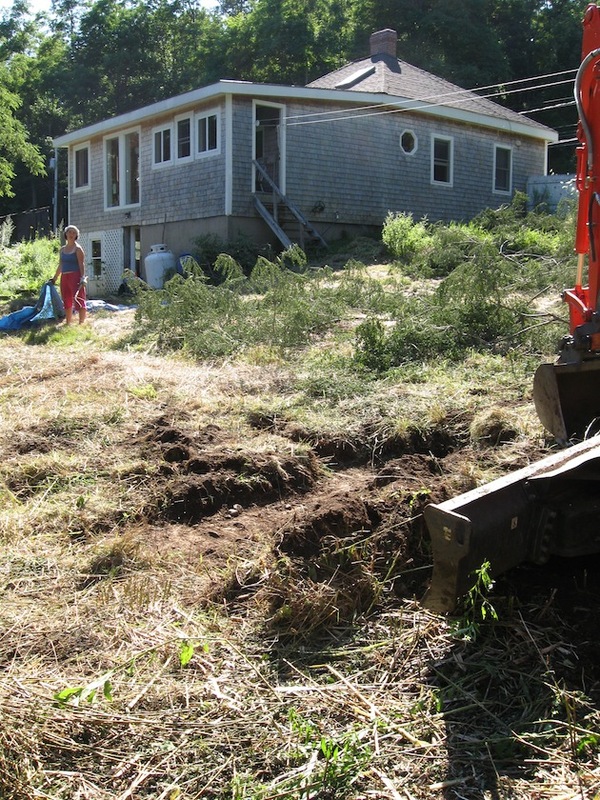 While the load of an excavator is distributed evenly across the tracks, i didn’t want to risk driving over the septic tank, so for this terrace i had to scrape and move earth from either side of the tank. The advantage of a tracked vehicle is that even weight distribution, as opposed to a wheeled vehicle which has point loads on the bottom of each wheel. On balance, i think of this as a wise use of remaining petrol resources. These earthworks may well be here for generations, catching all rain runoff and recharging groundwater. The underground water lens will be used to feed an edible landscape. Once i was past any more underground pipes i could relax and dig a little deeper and go a little faster. I rented the machine for a long weekend (which meant 12 hours). I clocked 14. The terraces are not so much dead level as they are slightly pitched backward into the hillside. This way, the terrace can settle and become more level. In the meantime, all rain that falls is caught right where it falls and percolates into the earth. In the foreground you can see woody debris partially buried. By burying the woody debris from the trees, i turned a waste product into an asset. This buried wood will hold moisture, support the terrace, provide habitat for mycelium and other life, and slowly give up nutrient as it decomposes. I left this part of the terrace slightly high, anticipating some settling over the years. Interests Events Articles & Essays Home-scale design Farm-scale design Design/Build service Plant and Animal systems All of it, dude!